Nowadays, the most used East Frisian coat of arms is that of the counts of house Cirksena. It was created by count Rudolf Christian in 1625 and contains the emblems of the most important East Frisian chieftain houses, which were related by marriage or power to the house of Cirksena. From the the 13th century on, East Frisia was settled by free farmer, unaware of the feudal system that ruled most of the other of Europe. They obeyed no Lord, but elected their principals at the old governing assembly at the “Upstalsboom” next to the today’s city of Aurich. From these principals finally originated the houses that bore the chieftains at the end of the so called Frisian Freedom. Top left: The emblem of house Cirksena from Greetsiel. 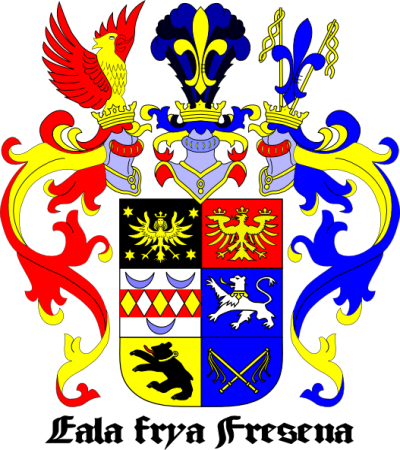 The heraldic picture shows the virgin eagle of the Cirksenas, that is also part of other emblems today, e.g. of that of the cities of Emden and Delfzijl or the principality Lichtenstein. Here, it shows the golden eagle on black ground. The Cirksena emblem returns also in the middle helmet on top of the East Frisian emblem. The Cirksenas became counts of East Frisia in 1464, but died out have been extinguished in 1744. Top right: The emblem of house tom Brok from the Brookmerland, a golden crowned eagle on red ground. This house bored the first chieftains, who achieved power over almost all East Frisia in the 14th century. They were defeated in 1426 by chieftain Fokko Ukena. Their emblem is also returned in the left helmet on top of the East Frisian emblem. Center left: The emblem of house von Manslagt from the Krummhörn, who were related already very early to the house Cirksena by marriage. It shows a silver field departed by a red bar that is alternating sequined by golden and silver rhombuses. On top of the bar are two blue and below the bar one blue crescents. Center right: The emblem of chieftain Fokko Ukena from Leer and Moormerland. Fokko ruled over the south of East Frisa, until he was defeated by the “Freedom Alliance of the Seven East Frisian Countries” under the leadership of the Cirksenas in 1431. Fokkos granddaughter Theda was the wife of the first count of East Frisia, Ullrich I. Cirksena, and ruled herself as a countess from 1466 until 1480. The Ukena emblem, an erected lion with a fallen crown, is also visible in the emblem of the East Frisian county of Leer today. Bottom left: This is the bear of Esens, still visible in the emblem of the city of Esens today. In the East Frisian emblem it is shown as a black bear on golden ground. Bottom right: The emblem of chieftain Hero Omken, member of house Attena. Its shows two cross whips and represents together with the emblem on its right (city os Esens) the country Harlingerland that was ruled by the Attenas for a long time. Chieftain Balthasar from Esens, who was the last of house Attena, died in 1540. The Harlingerland became finally, after a “detour” over count von Rietberg, under the power of the East Frisian count Enno III. The right helmet on top of the East Frisian emblem resembles the Harlinger emblem. The motto Eala Frya Fresena evokes the old tradition of the Frisian Freedom. Its origin and its translation is not very clear. Probably, it means something like “Rise, free Frisians” in contrast to the feudal prostration that was common in the rest of Europe then. Related to Eala Frya Fresena is the motto “Lever dood as Slaav” (“Rather dead than slave”), and was shouted as an answer to it. The colors of the flag are black-red-blue in three horizontal bars. These colors are originated in the emblem: black for the emblem of the Cirksenas, red for the emblem of the tom Broks and blue for the Harlingerland. Towards the end of the 20th century, the East Frisian “Landschaft” took overs this flag, by which it became officially the East Frisian flag. East Frisia – one country, two emblems? The big Cirksena emblem is not used by the East Frisian Landschaft, in contrast to the black-red-blue flag. Instead of this, the Landschaft owns its own emblem that was given by the German-Roman emperor in 1678. This is a unique procedure for such an independent organization in the history of the old “Reich”. The Landschaft was a second sovereign in the principality of East Frisia next to the Cirksena counts (and later next to the Prussian lords). It had the sovereign right to show its own emblem. That is why East Frisia has two emblems: the six-parted emblem of the counts, used commonly as the East Frisian emblem, and the Upstalsboom-emblem of the Landschaft. "Well mit blot Foten geiht, de drücken Schoo neet."